Hi lovely's I hope you guys are having an amazing day! I had the great opportunity to try some Loreal Paris Makeup products and on this post I am including the ones that worked for me and I keep reaching out for. First, I have combination to dry skin type. This is a medium to full coverage foundation and the consistency is just perfect, not too thick and not too runny. It has a demi/matte finish and when I use it I don't need to set it with a powder. This foundation is a dream come true for those with oily to combination skin. I have worn this foundation as long as 12 hours and after that it is amazing how good it looks and I can see how it really helps to control my natural oils from coming out to the surface. If you have dry patches make sure you moisturize and exfoliate your skin first since it will accentuate dry patches. I found out that it applies better with a beauty sponge. I love how flawless and natural my skin looks. It lasts all day without transferring all over the place or melting off. This foundation comes in a total of 12 shades. the skin. Both foundations apply flawlessly and evenly and they come in a squeeze plastic tube. This foundation comes in 12 shades as well. Two weeks ago I decided to mix the 2 foundations together and OMG! I just created the perfect foundation in consistency and staying power. The result is a medium coverage foundation with a natural look but still fights oils. I achieved that beautiful dewy finish without looking greasy and I didn't even need to blot. The best part is that you can get a custom level of dewyness. Have you ever tried to mix them together? The formula of the eyeshadows in this quad is velvety soft and pigmented. Each palette has a perfect combination of colors that includes everything you need for a full eye look, very little fall out, and they blend beautifully together without effort. The texture reminds me of my high end shadows. They can be worn wet or dry. The colors included in this purple palette are so bright and fun to play with. This palette is so unique in my collection since I don't have anything like it. The package is a well made, hard plastic. I love how compact it is which makes it travel friendly. Each palette includes on the back a picture description on how to use each color which is great. They have a total of 8 quads to choose from. 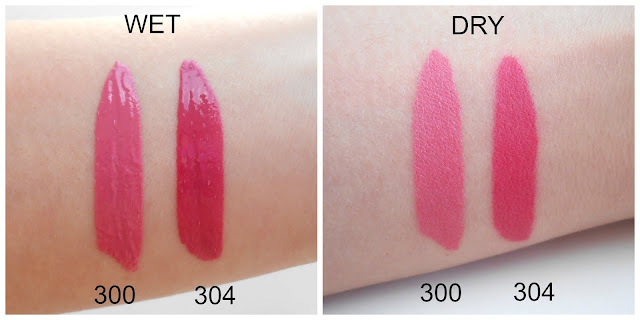 I have them in the shades 300 Blushing Ambition and 304 Rebel Rose. The pigmentation of these glosses is just insane, one swipe gives you an even full color pay off on your lips. The pigmentation looks more like a liquid lipstick than a gloss which is amazing and what I love the most about them is that they have a very comfortable smooth/light weight almost like a moussey texture. They have a light berry scent. They dry out to a semi matte finish about 2 minutes after application. They are not transfer proof so you have to reapply them throughout the day. They leave behind a subtle stain, the wear time for me is about 4 hours depending on how often and what type of food I eat or drink. They come in a clear slim package that shows you the true color of the lip gloss you are getting inside. They have a tear drop applicator that makes the application super easy and precise, it allows you to outline your lips perfectly. They have a total of 10 shades from nudes to bright tones. I used a combination of the Infallible Pro Matte Foundation in 104 and the Infallible Pro Glow Foundation in the shade 203. I am also wearing the Infallible Pro Matte Gloss in the shade 304 Rebel Rose. I received these products for a review purpose. Regardless, I only recommend and write about products I use personally, work for me, and that I believe will be good for my readers. I love L'oreal products and have to pick up some foundation the next time I'm out to control my oily skin. Great review! Such a pretty combo when you have it all on! I love the bit of sparkle in the eye shadows. Thanks for the review, love finding out about new (to me) products. I love that lip color! Seeing the wet/dry comparisons is also helpful. Thanks for the review - I might have to check out the lip gloss! 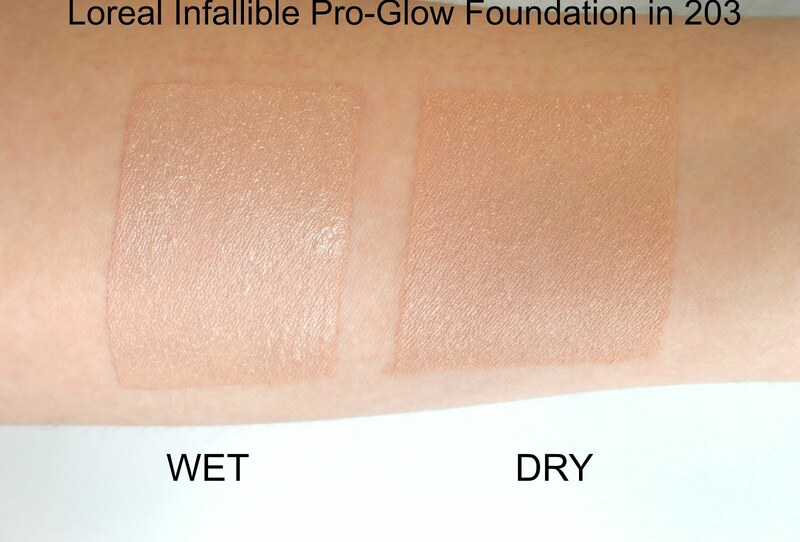 Interesting comparison between the wet and dry makeup. The colors are pretty but I tend toward more the the less bright colors. I love that shade. Haven't tried that selection from L'Oréal yet! Will have to check it out! I've been eyeing the Infallible foundations. I've been a Makeup Forever fan but I can't keep buying high end foundation. Great review. Love love love these products! Such a pretty lip color! ooh those eye palettes are so pretty. I love the colors and I think that is what I use most of all as a makeup besides lipstick. Very nice. I often buy L'Oreal products. I love that pocket palette and might buy it because violet shades go well with my hazel eyes! I love L'Oreal products!!!! I'm usually a makeup snob about most drug store brands, but I will buy L'Oreal! Haha I'm a snob sometimes too about drugstore makeup, but some of my favorite eye shadows are L'Oreal. I'm also excited to try the Pro Matte Gloss now! These are awesome Loreal Paris make-upInflallible Pro Matte Gloss is something I am for sure going to be checking out. I love both these colors. Thanks for sharing these awesome beauty products. L'oreal is one of my favorite drugstore makeup brands. That lip color is so pretty, I will have to grab it. Thank you so much Cacinda! Those look like fun colors. I tend to stick to grey though. They have so many different shades Meagan! Your make-up looks great! I'm going to have to buy this when I need foundation again. I love how flawless it makes your skin look. Love! Love, that lip gloss on you! You can never have too many! I'm adding this color to my shopping list! I wish they will give discounts soon! That lipsticks, how long does it lasts on your lips? Does it have a longer staying power like their previous collection? They would love these Debi! Makeup that I can actually afford! Yay! I love how thorough your review is. I really get a feel for which ones of these that I think I will want to give a try. And I definitely will give one or two of these a try. Great post! 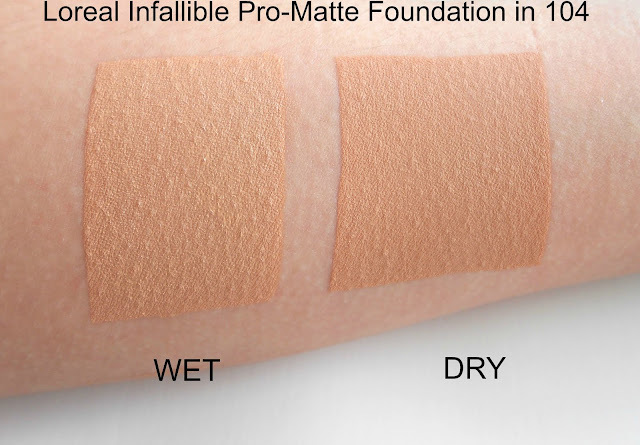 I'm a huge fan of the Infallible foundation line! Great reviews, I love the swatches. Great review!! You look gorgeous. I don't tend to wear make up but it's nice to have a stash for those special times!! I especially love the lip colors!!! I love the L'oreal foundations. They work well for combination skin. I have sensitive skin and the foundation works perfectly. Thanks for sharing the lip gloss swatches.